Drinks deals have come under a lot of scrutiny recently, with the government considering bans on everything from cheap shots to all-you-can-drinks, ineffectual measures that timidly skirt the only real solution, banning chavs. Helping you drink cheap while you still can, DrinkOwl. This just-launched, rapidly expanding iPhone/web app displays a wide swathe of whatever discounted whistle-wetting choices might be surrounding you, theoretically at any given time, though to prove that, you'd have to be near that one place with 24hr drinking. 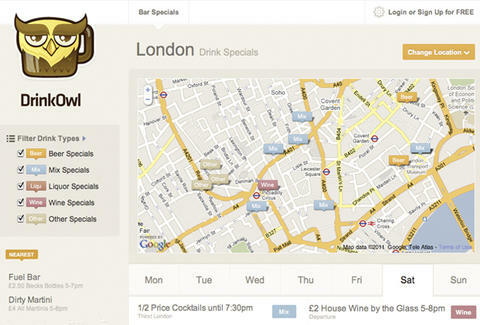 The simple interface is displayed either as a proximity-sorted list or a Gmap studded with establishment-repping flags, each colour-coded to show what type of sauce is being slashed (beer, wine, liquor, mix, "other"); the display's also filterable by preferred booze-type, though enough of any of them will make all women your-type. Tapping on a deal reveals specifics (half-price 'tails, £1.50 pints, etc. ), plus just how long's left before last orders; drill deeper for directions from your current location, phone numbers, weblinks, and a calendar showing what they're knocking off for the rest of the week, enabling your ability to knock off the same. While it'll take time to fully build up, the lineup already ranges from Holborn's Guanabara, to The City's Mary Jane's, to Soho's Thirst, and they plan to add off-licenses & supermarkets in the near future, though this could also attract scrutiny if it ends up leading to more than a Lidl trouble.